A man who had reached his 100th birthday was being interviewed by a reporter. “What are you most proud of?” the reporter asked. “What a beautiful thought! How inspirational!” said the reporter. Is that your approach to dealing with your enemies? Is it just to avoid and ignore them, hoping that you outlive and outlast them? Maybe you secretly hope and plan and pray for bad things to happen to them. Or maybe you take a more active stance toward your enemies and gossip about them, spread lies about them, turn them into the police when they do something wrong, and pray that God will punish them for their wicked ways. This is how most of the world operates toward enemies. We go to war with them. We plan and plot their demise. We rejoice in their failures and mourn at their successes. We write letters, make phone calls, send e-mails and muster up support among our friends. We try to get people to side with us and join the team of those who are angry at others. That’s the way the world often behaves towards its enemies, but the church often acts in similar fashion. Although we sing the song “They will know we are Christians by our love” most often, people know we are Christians by our hate. Christians today are mad at the world. We’re mad about movies, the media, the militant movements…of…gays and lesbians. We’re mad about the ACLU, condoms in school, crime on the streets, and drugs in our neighborhood. We’re mad about education, the impact of society upon our children, and abortion activists. Certainly the Bible talks about not loving the world, or the things of the world. We are commanded to come out from among them and be separate. We are called to be salt and light in a sinful world. We are called to speak out boldly with prophetic voices calling people to repentance. But all of this must be presented with compassion and concern. Truth must be spoken in love. Like Jesus, we are to people full of grace and truth. Our culture must know us as truth-tellers, but we must be truth-tellers with tears, for it is not we who are the victims, but they. They are the ones who are enslaved to sin. They are the ones whose minds are darkened. They are the ones whose eyes are blinded. When we interact with our enemies, it must not be out of hate and spite, but out of love and compassion. This is Christ’s example and instruction. It is the instructions of Christ on how to treat our enemies that we encounter in Luke 6:27-38. This passage falls near the beginning of one of Christ’s famous sermons in which he instructs His disciples on how to live as His followers. This sermon in Luke 6, along with the sermon in Matthew 5, 6 and 7, are the instruction manuals for Christ-followers. 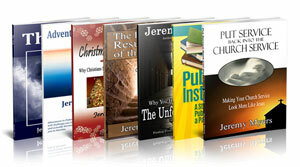 If you desire to follow Christ, these chapters tell you how. They contain truths that Christ practiced and lived by, and as imitators of Christ, what we also should live by. If we were going to summarize the entire sermon down into three words, they would be: “Attitude is Everything!” As we work our way through this sermon, we find that it turns our world upside down. Christ gives us some commands and some principles which are practically impossible to carry out consistently. As I have wrestled and struggled with this text these last few weeks, I have come to the belief that in this sermon, and in the one in Matthew 5-7, Christ is not setting out another list of do’s and don’ts. Many people read this sermon and the one in Matthew, and imagine that Christ is providing His own version of the law. The sermon in Matthew really brings this out. Over and over again, Jesus says, “You have heard that it was said [in the law], but I tell you…” So people think that Jesus is teaching his higher standard of the law, that He has brought his own, new law which we are to live by. The main problem with this way of thinking is that if Christ is presenting a new law to live by, it is more impossible to keep than the old law, for it’s standards are higher. Jesus is trying to show us that law keeping is all about attitude. Attitude is everything. Throughout history, people have imagined that they are keeping the law if they simply do what it says. If they perform the outward actions prescribed by the law, then they are doing all that is necessary. Jesus preaches this sermon to show us that keeping the law is not so much about outward actions as inner attitudes of the heart. In Luke 6:20-26, we saw that Jesus wants us to develop an attitude of trust toward God in our circumstances. Christ now moves from talking about our attitude in our circumstances to our attitude toward other people (Luke 6:27-38). Whether we are interacting with friends or enemies, Christians or non-Christians, our attitude toward other people should be to love them. None of us have problems loving the friends and family members we get along with. It’s the people, and even family members or other Christians who seem to hate us, and the people who are out to cause us harm, and the people who spread lies about us that we have trouble loving. And so it is these people that Jesus focuses on in Luke 6:27-38. These verses provide instructions on loving those we would rather hate. Christ shows us what our attitude should be toward those we would rather hate, and how to develop and live out that attitude. This attitude Christ is stated in Luke 6:27. Luke 6:27. But I say to you who hear: Love your enemies. The first things to consider is who are enemies are. Let’s begin with who they are not. They are not ministers ordained by God to show us our sins. When something a pastor says makes you think he’s been reading your mail, and eavesdropping on your thoughts, that is the Holy Spirit using the pastor’s words to get through to you. The pastor is not your enemy when he points out your sins any more than the Holy Spirit is, for the pastor is only doing what God wants him to. Rulers and those in authority are not our enemies either. They have been set up by God to administer justice and keep the peace. We may not agree with everything a politician stands for, or every decision the president makes, but they are not our enemies. Nor are people whom God brings into our lives to point out our faults. Sometimes God uses other Christians to show us where we err. But as Proverbs says, wounds from a friend can be trusted. Do not hate those who lovingly and gently point our your weaknesses, but let them guide you into more Christlike living. Finally, people who disagree with us on some of the finer points of theology are not our enemies either. We may argue with each other. We may debate. But we are not enemies if we all hold to the basic tenants of evangelical Christian doctrine (inerrancy of Scripture, the deity, humanity, sinlessness and bodily resurrection of Christ, the Trinity, and salvation by grace alone through faith alone in Christ alone are some of the most basic). Just because these sorts of people are not our enemies does not mean we should not love them. We are supposed to love all these people – the pastors, and parents, and politicians, and presidents, and policemen, and those who speak with prophetic voices into our lives – but they are not our enemies. Our enemies are those who purposefully and knowingly seek our ill-will. They have bitterness and hatered in their hearts against us. They do not seek our good, but only what is evil. It is these people we are to love. 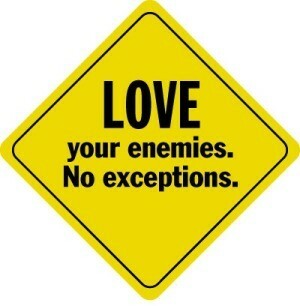 Loving our enemies goes contrary to what feels right or normal. Loving our enemies is a challenging thing. But understand what the word love means. It is the Greek verb agapao which is unconditional love. This means that we show love to them – no matter what – even if they remain our enemies for life. 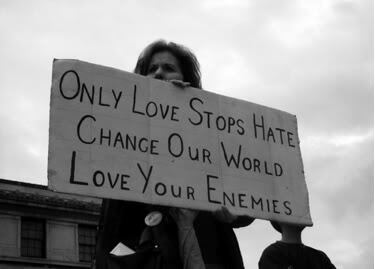 Understand though, what loving our enemies does not mean. It doesn’t mean we support them in what they do, or agree with them, or even necessarily become good friends with them. Loving our enemies means that when they hate us, we love them in return. It means that the cycle of hate, the cycle of revenge, the cycle of retaliation stops with us. You can be angry at a person for what they do, and yet still love them. Jesus was upset at the people of Jerusalem for how they abused and murdered the prophets, and yet He still shed loving tears over the city. Jesus, as always, is our best example for how to live out such principles. He never asks us to do something He has not already done Himself. As you read through the Gospels, notice how Jesus loves his enemies. Take Judas for example. Jesus wasn’t ignorant of who Judas was or what he was going to do, but Jesus loved Judas anyway. The next time you read through the Gospels, notice how Jesus interacts with Judas. He never slights Judas. Never has an unkind word for Him. It seems at times, that Judas gets better treatments and more special love from Jesus than some of the other disciples. This is the same example we see from God. God loves His enemies. Maybe you’ll call me a heretic, but I believe that God loves Satan. He doesn’t love the things that Satan does. He doesn’t love the rebellion that Satan leads. He doesn’t love the horrible results of Satan’s actions. But I do believe that God loves Satan. The principles of Scripture lead to this conclusion. Furthermore, Romans 5:8 says that God demonstrates his love for us in that while we were yet sinners, Christ died for us. Two verses later, we are told that while were yet enemies of God, God reconciled us to Himself through the death of Jesus Christ. 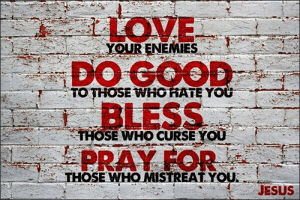 And even here in Luke 6, if Jesus tells us to love our enemies, we can be sure that God loves His enemies. He never asks us to do something which He does not do Himself. 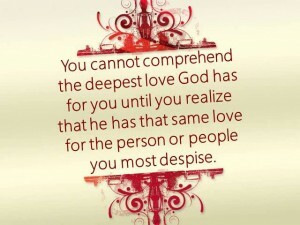 If God can love someone as wicked as Satan, God can help us love our enemies also. Probably, the only way we can love our enemies is with the supernatural help of God. Loving our enemies is so foreign and backwards to the way our flesh operates, that only by divine help can we learn to develop an attitude of love for our enemies. 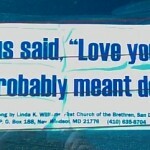 It must be stressed that the emphasis is on love. We will see as we dig more into Christ’s statements in the rest of this section that a strict, literal, legalistic interpretation and obedience to the text cannot always be carried out in a loving manner. Sometimes, you will be forced to choose between loving a person, and doing what Jesus says. For example, Jesus says in Luke 6:30 to give to everyone who asks you. Parents all know that sometimes it is unloving to give their children what they ask. This is the same way God treats us and the same way we should treat others. What if it is a drunkard or a drug addict asking you to give them money so they can feed their addiction? In that case, it might be unloving for you to give them money. Maybe you can buy them a meal instead. That would not be literally obeying Jesus, but it would still be loving, and would therefore be keeping the spirit of the text rather than the letter of the law. So love is the overriding principle that governs how and when the exhortations and illustrations of Christ are realistically carried out. Alexander Maclaren writes, “The principle…is that love has no limits but itself. There may be resistance to wrong, and refusal of a request, if love prompts to these…We must live near Jesus to know when such limitations…come in, and to make sure of our motives.” We will see much more of this as we work our way through Christ’s sermon. He turns now from the guiding principle of loving our enemies to three exhortations on how to do this. The intriguing thing about these three exhortations is that they work both ways. They both help us develop an attitude of love for our enemies, and as we do them, they reveal an attitude of love for our enemies. Let me put it another way. You have all heard that if you’re feeling depressed, one way to cheer yourself up is to smile. The outward and physical act of smiling somehow causes an inner attitude change from depression to joy. I don’t know how it works, but it does. Sometimes we smile because we are happy, but other times, we smile in order to become happy. Similarly, think of a Biblical principle for a loving marriage relationship. How often have we heard from couples who are getting a divorce that “they just don’t love each other any more”? What they mean is that they don’t have the feelings of love for each other any more. And what you will hear from many marriage counselors is that love isn’t a feeling, it’s a choice. And that’s true, but I’ll tell you what, it’s the feelings of love that keep a marriage exciting and keep a marriage enjoyable. The choice to love keeps a marriage together. The feelings of love keep it exciting. So although love is a choice, it is also a feeling, and I think the feelings have to be there in order for a man and wife to remain “in love” with each other. So what are they to do if they don’t feel love anymore? The Bible teaches that if you are married and you have lost the feelings of love for your spouse, the best way to get it back is to do loving things for your spouse. The Bible calls this “doing the first works.” Sit down, and think long and hard about what you did as a couple when you were dating, and when you first got married. What dates did you go on? What enjoyable things did you do together? Then, when you have five or ten things – go do them! The action of doing loving things will eventually produce a feeling of love. Most people say, “Well, I can’t do loving things for them, because I don’t feel love.” No, when you have fallen out of love, it works the other way. You do loving things for them, in order to fall back into love and feel love again. Feelings of love are vitally important in any marriage, but unless the actions of love continue, the feelings will wane and die. The reason I point all this is out is because Christ is about to give us three exhortations, and three actions to perform, in order to show love to our enemies. Maybe your enemy is your spouse. Or another person here in church. Or a person on your street. Or your boss at work. Whoever your enemy is, I doubt very much that you feel love toward them. But Christ is going to give us things to do for them to help generate love. We don’t do these things simply because Christ told us to, and we’re going to follow the letter of the law. No, we do them in order to develop and reveal genuine, heart-felt love for them. The first practical way to develop love and show love to our enemies is to do good to them. Christ says at the end of Luke 6:27, do good to those who hate you. Does this mean that we are to do good to a criminal when he tries to rob or murder us? Does this mean that we are to aid those who are out to destroy us or our family? No, it does not. Although God may love Satan, He does not aid Satan. Scripture does not require us to perform acts of kindness to an enemy which will help that enemy do more harm to us or a loved one. Our mercy to our enemy must not be so far extended as to expose us to the mercy of our enemy! We will develop this in much greater detail when we look at Luke 6:28-30. But for now, let’s just consider a few practical examples of how to do good to our enemies. Do you have a boss you can’t stand? Show up early, stay late, work extra hard. Send him a note of appreciation. Is there a neighbor who lets his dog poop in your yard and dig in your flowers? Do they come over and seem to think you have nothing better to do than shoot the breeze? Are they loud, obnoxious, degrading and insulting? Take them a plate of cookies. Listen to them while they talk. Uplift them with your words. Jesus says to do good for our enemies. Do you have an enemy? Pray and think this week about what good you can do for them. Some people think that way though. And they get it from Proverbs 25:21-22: “If your enemy is hungry, give him food to eat; if he is thirsty, give him water to drink. In doing this, you will heap burning coals on his head, and the Lord will reward you.” Many people think this has something to do with making our enemies angrier at us and somehow, our kind deeds toward them will only make things worse for them. We read this idea about heaping burning coals on their head, and we assume it refers to some sort of judgment from God upon them. But that is not what it means at all. In the Middle East, rooms were heated by a low grill or fireplace which was centered in each room. A fire was going all the time. This was where the family meals were cooked, and family members would gather for warmth whenever the weather turned cold. Every night, they would “bank” the fire and hope it lasted until morning while they slept. If they wakened one chilly morning to a cold room because the fire had gone out, they would take a metal or clay pot to a neighbor’s home and ask for a few coals to light their fire. If the neighbor was kind and had coals to spare, the borrower would carry the kettle of coals back home in the usual Middle Eastern manner – on the head. Proverbs 25:22 is teaching that when an enemy asks for coals to heat his house, give him almost all you have. Most people, when they had a good pile of coals, would only give one or two, and keep the rest for themselves – even if it was a good friend coming for coals. The writer of this proverb says to keep one or two for yourself, and give all the rest to your enemy. In this way, you will get great reward. Imagine your enemy is having company over, and is baking some bread, but ran out of ingredients. The store is closed, so they come to ask you for a cup of flower, or an egg. Most of us, if it was an enemy, would say, “Sorry, I’m all out myself” or “Well, I only have a little bit left and I need it for my own cooking.” The writer of Proverbs 25:22 says to keep one egg for yourself, or one cup of flower for yourself, and give all the rest to your enemy! Shocking, isn’t it? Yet this is the same thing Jesus teaches in Luke 6 (cf. also Rom 12:20-21). Do good to your enemies. Not to bring more judgment upon them, but simply to show love for them. We do not do good to our enemies so that they receive worse judgment, although some people live that way. And that is true. We do destroy our enemies when we make them our friends. But history and personal experience reveal that very rarely do enemies become our friends when we do good to them. Very rarely does doing good for someone who hates you cause them to start loving you. Sometimes doing good for an enemies will cause them to become a friend, but hating and harming an enemy never has. So it is better to do good for them, even if they continue to hate us. We’ve seen some of this in Iraq. The Unites States has tried to win the people of Iraq over to our side through humanitarian aid. We got rid of the oppressive dictator Saddam Hussein. We’ve dumped billions of dollars into food and reconstruction. But what have we seen? A lot of the Iraqi people still hate Americans. Very rarely does doing good for an enemy turn them into a friend. Often, they just take what we give and use it against us. But that is no reason to stop doing good to them. There is always the hope that they might become our friend. But we cannot expect it. So this is not the reason we do good to our enemies either. So if we don’t do good to our enemies to bring more judgment on their heads, and we don’t do good to them in order to turn them into our friends, why should we do good to them? We must do good to those who hate us for one reason only. It is only by showing love to our enemies, and doing good to those who hate us that we display to them the love of God. And maybe, maybe, if we show them the love of God, they will experience something they have never experienced before, and will want more of it. And they may come to us, or they may turn to the Bible because they know we are Christians and live according to it, and they will learn of God’s infinite love for them and so be converted. We show love to our enemies because that is what God has done for us when we were His enemies, and that is how we were brought into His family, and that is how, hopefully, they can be brought into the family also. I am convinced that one of the reasons so much evangelism fails today is because people cannot see the love and grace of God in our lives and actions. Forget showing love to our enemies for the moment, most of the time, we don’t even show love to our own brothers and sisters in Christ! I am convinced that the church as a whole would be more effective in completing the Great Commissions of making disciples of all the nations, if we were more effective at carrying out the great commandment of loving God and loving one another. “We will never be successful in carrying out the great commission until we truly implement the great commandment.” We cannot evangelize the lost until we love the saints, and we cannot love our enemies until we love other Christians, but it all begins with love. Loving God, loving one another, and loving our enemies. David Cho, pastor of the world’s largest church in Seoul, Korea – with some 750,000 members – has an interesting rule for his congregation. He tells them that they are not allowed to witness to someone until they have performed three good deeds for them. They are actually forbidden to mention the name of Jesus until they have first helped that person fix an appliance, or brought them a meal when they were sick, or helped them construct their house. Pastor Cho believes that only after three such acts will the heart be open to the gospel. Do you have an enemy? Love them. How do you develop this love? Do good for them. As you do good for your enemies, the amazing miracle of divine love will blossom in your heart for them. You will reveal what the love of God has done for you, and what it can do for others also. You will be like Christ to them. Then, unlike the man at the beginning of this message, you will not be so focused on outliving you enemies, but on living for them. This is what Christ has done for us and what He wants us to do for others. A man was seen one day going in a boat on a river with a large dog, which he wished to get rid of by drowning. He succeeded in throwing the animal into the water, but the dog kept trying to get back into the boat. As the man was attempting to beat the dog from the boat, he fell overboard. Witnesses say that the man would have himself drowned if the dog had not seized him by his coat and brought him to shore. When someone tries to do you harm, do them good in return. As Paul writes in Romans 12, do not overcome evil with evil, but overcome evil with good. Great word Jeremy Myers! Not sure if I can buy your interpretation “heaping burning coals upon the head of your enemy” passage, but if it turned out to be true I would have no problem with it. King Solomon was not Jesus and did say many worldly wise things, that may or may not be Spiritual. Never-the-less, it is the kindness of God that leads men to repentance! Think problem with love is that most people do not even begin to understand what it means and if God is love, they will never get to know Him either! God said first love God with HEART, MIND and SOUL! There is a reason He uses all 3 and I believe when these 3 are in balance you experience perfect or Godly love! Then he said love others as you love yourself – if you do not know yourself, how can you love yourself and then how love others? Cor 13 says it all comes to nothing if you do not have love! Thank you for a great article on loving enemies. I am the most horriblest Christian when it comes to loving my enemies in my family. But now I have a tangible way of loving them. I know too I don’t have to do it in my strength. We are all pretty bad at loving our enemies. Glad you found this message helpful. Beautiful article! I came across it because The Lord keeps placing Luke 6:27-29 in my path. I have been asking Him to help deal with 2 coworkers who have been so mean, unkind and devious in trying to undermine my skills and take over my responsibilities. In fact, I underwent surgery and while I was out for 3.5 weeks they did manage to take away my project. Now I’m stuck during menial tasks. But The Lord came to me in my dream during my recovery commanding me to love my enemies. I told Him my flesh couldn’t do it w/o His help. I said I understood what He wanted but I wanted to be able to have His supernatural power so I began searching and I was lead to your article! Glad you found it helpful. Loving our enemies is extremely difficult, but following the instructions of Jesus (and His example) will help us obey Him in this critically important way. Let me know how it goes with your coworkers! Correction : I have The Holy Spirit living inside of me so I do have the supernatural power of God and I am expecting supernatural results; I want to be a good and faithful servant to The Lord that is why I began searching on how to love my enemies and thus came across your excellent article. It helps to put it all in perspective!! Thank you and God bless! ​The BIGGEST problem with this “sermon” is that it is MAN-CENTRED . It is not about Christ which is what Luke 6 and Matthew 5-7 are about. It is FOR THE SAKE OF CHRIST. These passages are about the evidence of salvation. This is a social message and quite unbiblical. Any sermon that is MAN-centred cannot be of God for God’s Word is always GOD-CENTRED. What this man wrote is to tell a person to do good to others. That is not what the Bible teaches. The Bible teaches us to point people to Christ. There is a clear distinction between God’s enemies and the believer”s enemies. Believers are to hate God’s enemies. Psalms 139:19-24 (KJV) “Surely thou wilt slay the wicked, O God: depart from me therefore, ye bloody men. 20 For they speak against thee wickedly, and thine enemies take thy name in vain. 21 Do not I hate them, O LORD, that hate thee? and am not I grieved with those that rise up against thee? 22 I hate them with perfect hatred: I count them mine enemies. 23 Search me, O God, and know my heart: try me, and know my thoughts: 24 And see if there be any wicked way in me, and lead me in the way everlasting.” This is not made clear. Cho Yong Gi is a terrible pastor and probably an unbeliever based upon his theology of “positive thinking” and the erroneous “name-it-claim-it” materialistic carnality. Why did this writer use his words as an example shows that this writer lacks discernment. The subtle errors in this sermon is deadly. “Burning coals on enemies’ head” is not correct for the text did not talk about more or less coals. These passages in Luke 6 and Matthew 5-7 are not about “attitude” but about a transformed life. If the person is truly a believer this is what happens to all the relationships in his life. His relationships toward God’s Word, God, possessions and people have all been transformed by the power of God through Christ. What Christ describes in these passages is not an option for the “man to do so that he can become good” but the transforming power of the gospel as evidence or fruits of a transformed life in Christ because he has already been made good in Christ. This is a description of the new person! and not trying to be a new person by doing good works, even though these are Christian works. The passage of the Luke 6 was not properly explained. The exegesis was poor. It lacks depth. The measure of a good message is that when the sermon is completed the person knows God’s Word better. Sadly this was not the case. Eh… what? Who is Cho Yong Gi? I have never heard of him. You know the funny thing about your comment is that Jesus, being fully human, was completely man-centered. He loved people, ministered to people, taught people, and showed people how to live. He did not fall into the trap that so many religious people fall into, which is to think that life is always and only about God. That is a dualistic, gnostic way of thinking which completely misses the point of Scripture and the incarnation. Dear Sir, I apologise for not using the same name that is found in the article — “David Cho, pastor of the world’s largest church in Seoul, Korea – with some 750,000 members”. Cho Yong Gi is his Korean Name. Cho Yong Gi has been to prison for “money issues.” But that is beside the point, because his theology is faulty. Life is not always about “God” as you so aptly put it but it is always and only about “Jesus Christ, the Son of God.” Jesus says, He who has seen Me has seen the Father.” To promote Christ is to promote God. To know Christ is to know God. The Bible is not about a man-centred but a theocentric theology. Your “tagging” of “a dualistic, gnostic way of thinking” is sadly out of point. A theocentric theology glorifies God which is what the chief end of man is. It is always to point sinners to the Saviour and not himself. Read through the article please and you will find that the author has missed the thrust of Christ’s words to His disciples which was to point sinners to the Saviour so that they could be saved from sin, death and hell. Jesus Christ was teaching His disciples to bear the fruits of salvation so that others around him will be able to see Christ which in turn will point them to Christ who will save them from their sins. Sharing the gospel of Christ according to the Scriptures backed up by a life of holiness is the best way to point others to Christ. Sadly this was missing in the above article. Maybe, just maybe it’s about obedience and not sacrifice? A child like faith to simply do what Jesus said, not to dissect it, not to completely break it down, analyse, and argue about. Just to do what we have been instructed to do, and in doing so being obedient. So what if I don’t understand fully about burning coals, that’s God’s side of the equation, I simply need to do what I have been told by the person I call my Lord. Someone posted “easier said than done” and yes I fully agree with them. To live what you have been told to live, to do what you have been told to do and to deal with the emotions that surround that is often a difficult thing. My case in point is having been tricked out of $400k in a property deal with family, not going into the details suffice to say these where family members I fully trusted, people I live in close proximity to for almost 15 years with my family. And one day they turned on us, end result was we had to leave the property that we had agreed to buy from them, never seeing any recompense for our share of ownership. I have had to live that scripture to the tune of 25 years of hard work lost, 25 years of my family sacrificing and going without so that we could honour our agreement only to have it all taken from us. In all honesty I still have to remind myself to do what Jesus said daily, if I don’t and if I dwell on it it festers and would allow bitterness to grow. When Jesus said to love those that would harm you he was not talking about a singular point in time event, he was talking about a life long adjustment to our attitudes, towards ourselves, towards others and ultimately towards him. Not always easy as others have pointed out, but entirely necessary to demonstrate that Christ first loved us. Oooh! So critical, both of what is written, the writer, and of a pastor. Did you read the entire sermon, or merely skim through a few parts? Where does it say to try to be a new person by doing good works? The Bible does not “tell a person to do good to others”? “This is not what the Bible teaches”??? This is not what Jesus did? What Bible do you use? Dear Sir, I am sorry if you find my response “so critical.” The Bible teaches — When a sinner becomes a believer in Christ he is already fit for heaven, instantaneously as was the case of the malefactor who was crucified with Christ and Jesus said to him “today thou shalt be with Me in paradise.” Since every believer is fit for heaven then why did Christ leave believers on earth, which is filled with sin, and wickedness and evil and put them in harm’s way? The biblical reason is that believers may be able to point people to the Saviour i.e. to continue to work of Christ on earth after His resurrection and ascension. Many theologians call it the Great Commission (cf. Matthew 28:18-20). To be able to point others to Christ is the greatest honour that Christ and God the Father have given to all sinners. Your life and my life on earth as a child of God can either point others to “self” or to “Christ.” To point others to self and say “how great I am” serves no eternal purpose for others will say nice things about you but they will still die in their sin and end up in hell. However, when you point them to Christ they will see Christ in you and glorify God by becoming Christians themselves and be delivered from sin, death and hell. Your life on this earth can have this eternal impact in the lives of your friends and loved ones. Is this not better? Can you think of anything better than this? That is why it is not only about “good works” but that our “good works” point others to Christ who is the only One who can save. The problem with the above article is “about just being good” but not “about good for Christ’s sake.” I apologise if I have not been clear. Read the fifth paragraph from the end. This is not about pointing others to self. This is not “about just being good”. This is about following Jesus’ instructions, which if followed will necessarily point people to him. “We show love to our enemies because that is what God has done for us when we were His enemies, and that is how we were brought into His family, and that is how, hopefully, they can be brought into the family.” This is not about salvation by works, nor is it about drawing attention to oneself. Dear Sir, Please read from the beginning to the paragraph (fifth from the bottom) you will find that it is merely about “doing good” for doing good sake. By sprinkling at the end a sentence about pointing people to Christ is not what Luke 6 is about. The entire message of Luke 6 by Christ is about bearing the fruit of salvation and point others to Christ. That is the weakness of the message. It is as if the author already has in mind what he wanted to say and then picked a passage of the Bible to support his view. This is eisegesis that is categorically classified as a no-no in seminary and Bible Colleges. Exegetical preaching where the meaning of the text is drawn out and let the Word of God speak for itself should be the way to preach. This latter method of preaching helps the Christian knows God;s Word first which means that he knows God better. With this truth in him, he lives the life of a Christian and points others to Christ. Luke 6 is more than just doing “good” works but practicing the life of a Christian according to Scriptures. Thanks for your time. God bless. Has anyone seen a plank around here? I usually find it in my eye, but it looks like someone may have found it. Man of God , am so blessed for this glorious article. The Lord be with you! I am a pastor too. I think the problem is that there is a lot of confusion in Christianity about the origin and nature of satan. If we think of “the satan” as the spirit of the accuser, then yes, God hates it, because that is the nature of some of the worst of sins, and sin destroys us, which is why God hates it. But if we think of “Satan” as a being whom God originally created good, but who has fallen into rebellion, then I think that God has the same feeling toward that being as He has toward us: a strong mixture of sorrow and love. Love, because we are His creatures, and sorrow because we have become trapped by sin and lies. Interesting stuff to think about, right? It is an area of speculative theology, so there is no definitive answer in this age. But it stands to reason that if God “so loves the world” in its rebellion against Him, that He might also love the leader of that rebellion. I think Jeremy was very careful to point out that it was merely his opinion, and also not to confuse love of the person with love of the person’s deeds. Thank you Jeremy Myers! This was an eye opener for me! Also the many comments helped me. Be blessed! So does this means the crusaders and the knights templar were wrong. I think the bible wants us to stop evil in anyway we can, and god seems okay with flooding the planes. Heh, he even has no problem killing babys, so why should we have a problem with say, killing adolf hitler. I’ll love him as a human, but I will hate him as an individual. Yes, the crusaders and the knights templar were wrong. They were sanctioned by the Roman Catholic church, not God. God always gave nations sufficient time to repent before bringing judgment. I’m not sure what planes he flooded. Very thoughtful and helpful message Jeremy. Once again, I appreciate your keen ability to rightly give us the whole counsel of God. I want to encourage you to blow off the bitter gentleman who obviously has a myopic understanding of the heart and message of Jesus. I appreciate that you responded as a man of love by not repaying venom for venom. Well done.